Special shout to Freedom's Phoenix for finds on NSTIC. The latest on "NONSTIC" finds that the proposed identity program is undergoing technical problems and experiencing delays. Do you think that has anything to do with the fact that so many people don't trust their government to run identity, or much of anything really for that matter, in cyberspace? WaPo gives thoughtful consideration to the high concept of US national identity. Interesting report also trolled up from The Bradley Project here. Babbage @ The LA Economist experienced his own version of the modern checkpoint society tolerated in California and made some observations about the current status of REAL ID. Looking on the bright side, officials in Sacramento reckon that if manufacturing the new driving licences is that difficult for professionals, then all those biometric details and security features are going to make it prohibitively expensive for counterfeiters to reproduce. That is no doubt true for the backstreet forgers around MacArthur Park. The worry is that if driving licences become worth thousands of dollars instead of mere hundreds, organised crime could move into the bogus-ID business in a big way. Latest and greatest from Papers, Please! : Update on jury trial of Phil Moek who refused identity to fly. The essential guide to PNR or Passenger Name Record database debacle, and an Interview@AntiWar.com. Follow Ed Hasbrouck on twitter. BTC - Here's the last word on recent stereo surround sound filling my office about the CIS report. Today's Real ID revival looks like this and sounds like this. But it's really just this. CIS leads a charge to reinforce federal license credentials as "secure" and a worthy investment by State governments to shield us from identity fraud, terrorist attempts and being mistaken for an undocumented immigrant. This lobby can't assure us of identity security, due to ongoing evidence of internal fraud at motor vehicle divisions. The cost is far above an additional $2 as Chertoff stated. BTC - It's like no one listens when I scream "THE ZOMBIES ARE SHUFFLING!" Except, Jim Harper. What am I talking about? The Center for Immigration Studies released their legislative agenda about the natural, incremental progress of Real ID - or the federalizing your drivers licenses. Jobs are not as plentiful to kick down to local or national contractors. So they'll hang onto dear life to that little gold star or the holographic laminate they are paid to produce so they can keep the lights on. Life is so sad when all we are left with is sympathy for the economic cannibalism of the American taxpayer. What am I supposed to say? Hey, Janice you didn't look fat on Jesse Ventura's Conspiracy Theory? GO 9-11 Commission? What should I do? Shout in the faces of people who can clearly see Real ID is a gutted zombie sloth which relies on the public's attention deficit and short term memory to survive? How about the fact that Real ID compliance gets dumped off at the 3rd rail because there are like 4 or 5 different national identity programs trying to spin off in Washington because Real ID didn't exactly take off? It would be easy to kill but certain folks are really attached to it. So why isn't it really really dead? The national identity proponents don't yet have the FIAT identity capital or the control that a comprehensive national identity program promised to deliver SO THEY KEEP TRYING. "We'll lose federal funding" or "What about the 9-11 Commission report reccomendations?" or "What will they replace Real ID with once it's gone?" or "What about illegal aliens with the drivers licenses?" These are the excuses going in my ears when I say, "Let's repeal Real ID." We still want to disconnect one of the most totalitarian measures of social control known to human history from American life. We are talking a national ID card program here. 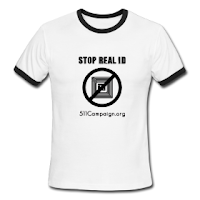 Real ID doesn't just compromise privacy and cause discomfort to civil libertarians - it's a sure shot way for the government to criminalize you for being because IT CAN. I think John Stewart cut up the 9-11 Commission credit cards for leaving the first responders for dead. I think Naomi Klein showed the world what crisis/disaster (global interventionist) capitalism is really about. I think CIS' strategy for whipping up an immigration/identity distraction this spring should be swapped for HOW ARE WE GOING TO GET JOBS FOR AMERICANS, LIKE YESTERDAY? You don't want Real ID benchmarks and incremental rigor mortis running your life? Pick up a phone or get off your duff and get down to your State and federal leaders office and demand a repeal. Then it won't be your fault, because you did something. "The Obama administration is creating a new office within the Department of Commerce to oversee implementation of its trusted identities in cyberspace strategy. " NIST finally makes the scene regurgitating Gary Locke's statement that "it's not a national ID card". It might really help to show us what the hell it is they are really talking about. Yet... plenty of people are putting it together on their own that NSTIC is like letting Facebook issue drivers licenses to Internet users. Or worse ... it's just the US government patronizing Internet users by saying "No, no!..it's not a government system to watch you! We just need to know if you really are who you say you are if you'll be using that computer in your home or at the cafe or wherever ...and that it's really you!" Yes, yes.. we've heard it all before.. "We [NSA, DHS, FBI, CIA, DoD] just need to know who is: flying, driving, walking, talking, travelling, buying, selling, etc. etc." It's got that new cybersecurity agency smell. I don't trust it. BTC - The Stanford NSTIC forum held by US Dept. of Commerce Scry. Locke Friday was well attended by privacy and technology field members. Intepretations of events were delayed because so many of the details are still unavailable, conceptual and probably undeliverable, due to federal budgetary lack. While the high concept NSTIC plan itself seemed clear to some, the details haven't yet been decoded for the general public. It may be because the scope of the program has been displayed as borderless as the Internet itself. After reading other reporting on the event, I figured my insights might be beneficial. The title of the project is the National Strategy for Trusted Identity in Cyberspace. 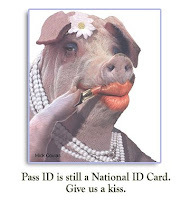 Locke stated from the gate that NSTIC "is not a national ID card program". No...but it does have a sweet spot for SmartCard to endorse it and discussions of ID cards were considered at one point. One clever attendee illustrated, by covering other words in the NSTIC moniker, the words "national" and "identity" were still present along with associations unaddressed by panelists. White House Cybersecurity czar, Howard Schmidt did mention there "is no centralized database". Okay. Unfortunately, we do now know it may not be necessary because PC technology will tell on their users involuntarily. Privacy settings are upgraded constantly. This is why the FCC entertains the "Do Not Track" list. CDT's Jim Dempsey was on hand offering a tempering idea: addressing current government approaches, handling and practices to digital privacy and civil liberty "before we make decisions based on impending threats." He is currently one of the nominees to Obama's privacy and civil liberty board. That's great; but we have a Bill of Rights which entitles us to 4th Amendment protections regardless of which way the US government panel rolls on things like sedition, free speech, identity and private property. There are at least 3 federal agencies now involved with NSTIC: Department of Defense, Department of Homeland Security and now the Department of Commerce. Too many cooks in the kitchen may be responsible for nauseating waves of bureaucracy. According to one source, after 3 years of policy development, NIST may be the only organization who can clearly navigate the agency mapping for all hands involved public or private. Now that the Dept. of Commerce is in on the game it does not necessarily DHS has stepped out to the exclusion of the matter. DoD heralds are ever present to the start up interests of most Silicon Valley ventures. There was no short attendance of "useful people" embracing parts of the NSTIC behemoth and providing amenity. Identity ecosystem proponents for interagency business and CEO's with track records for nationalized encryption all seemed to be trolling for federal subscribers, optimistic about gaining the United States government as an adopter or customer. Globalists were also represented to idealize the prospect for the US government to become the leader in international Net gatekeeping. There isn't doubt towards the ability of NSTIC parts and systemic counterparts ability to perform good things. What is dubious is why we are doing this, the true relevance of NSTIC and who pays to sustain that system. BTC: "Do we need the government to do that?" Some of the more unfortunate conclusions drawn are that NSTIC's identity driven data is a source of commerce. The prospect may be evolving that US government wants their own identity driven apparatus which culls information like Facebook's social network. NSTIC definitely has that megalomaniacal feel of a regular Dept. of Defense funded start-up combined with a democratically led entitlement program. Where the money comes from for such a grandiose, "global" national identity system matters.